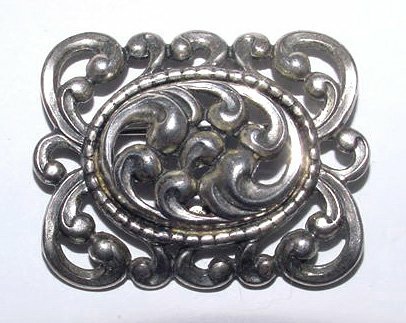 This vintage 1 5/8" wide sterling silver Danecraft brooch is inspired by Victorian sensibilities in its gesture and symmetry. A cutout wave pattern appears in the central oval area and repeats as a frame. The reverse carries the "Danecraft Sterling" plaque.